Kuriyama - Ureflex-2 Polyurethane-Lined Abrasion-Resistant PVC Material Handling Hose - 5 in. X 50 ft. - OD: 5.81 in. • Thick smooth heavy duty polyurethane lining - provides additional abrasion-resistance ... eliminates material build-up. 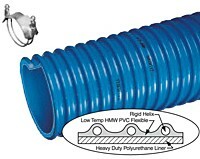 • Blue HMW PVC convoluted cover - formulated with static-dissipative compound ... also provides sub zero flexibility.